Cement, and its paved derivative, concrete, is a widely-consumed material in any modern society: residential walkways, recreational parks and building construction are just some of the many uses of cement. This year, upwards of 80 million metric tons of cement will be processed in the United States alone . As a building and support material, the two most important qualities of cement are its compressive strength (the capability to withstand an inward load) and its workability (the propensity of the cement paste to be deformable and fluidized). Unfortunately, these two qualities are not independent of each other. Water, which is added to cement to promote hydration of various minerals in the clinker (pre-hydrated cement material that is the product of heating limestone, silica, alumina and ferric oxide in a blast furnace, followed by rapid cooling), gives fluidity to the cement, but once the cement has solidified into concrete, the water not-consumed by hydration tends to separate and form microscopic pores (phenomenon referred to as bleeding) within the structure, lowering its overall compressive strength. On the other hand, supplying the cement with too little water decreases its workability and leaves behind weaker anhydrous clinker products. 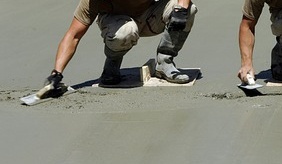 For concrete structures designed to support extensive loads (> 60 MPa), the water content tolerance is, therefore, quite low (~ 25%), and expensive plasticizers (materials that increase overall fluidity) must be incorporated into the cement paste to promote workability. For over 20 years, it has been well-documented that finely-ground calcite (calcium carbonate, CaCO3) can penetrate the pores between cement particles and accelerate the hydration of minerals , modulate cement settling time  and promote the generation of strong and space-filling hydrates (mono/hemicarboaluminate hydrates and ettringite ). These qualities provide the cement with greater workability and strength. However, since cement particles are generally dry-milled to a size of about 15 microns (µm), these effects can only be realized if the added calcite is comminuted to a particle size of 3 µm or less: at this size, CaCO3 can efficiently fill the voids in between the 15 µm cement particles . Current practices employ a wet media milling process (also known as: bead milling, wet pulverization, wet comminution, ball milling, wet grinding, micronization), in which initial CaCO3 particles sized on the order of 10s of µm are broken down to the required median particle diameter of d50 < 3 µm. This task is cumbersome, to say the least, and is associated with many significant drawbacks. The steel or silica balls used to impact with the calcite particles are expensive and must be frequently replaced. 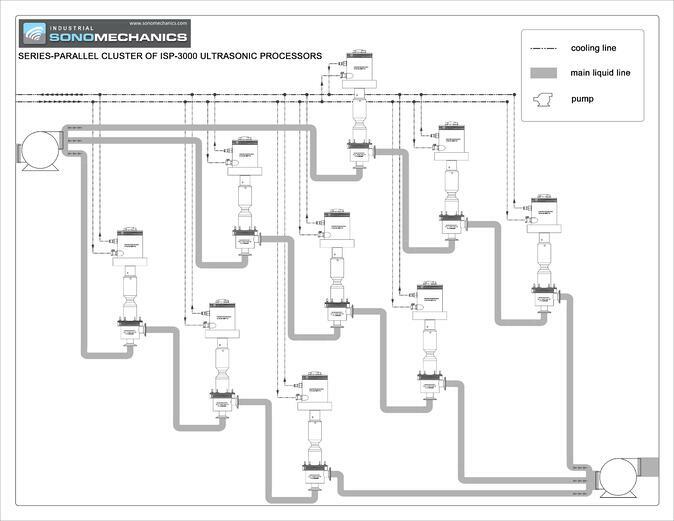 Post-process filtration is required to remove the ball media from the finished product, making wet media milling difficult to adapt to a continuous operation. The process is characterized by poor efficiency in the 0 - 100 µm range  so industrial-scale input charges can take multiple days to produce the desired particle size . Additionally, at least 10 parts of dispersant are required for every 100 parts of calcite  to deter particle flocculation. 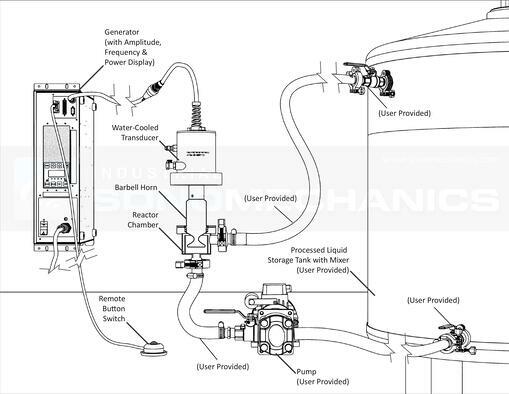 From the practical standpoint, the associated equipment is bulky, energy-inefficient, and requires extensive servicing and cleaning. In light of these drawbacks, Industrial Sonomechanics has developed a flow-through, ultrasonic wet milling process, which employs high-amplitude ultrasound to quickly reduce the size of CaCO3 particles down to the required d50 < 3 µm level. This method is directly scalable, has no need for expensive steel or silica media, requires reduced dispersant amounts and can achieve greater productivity rates at comparatively lower energy requirements than currently employed techniques . All components were pre-mixed on a magnetic stir-plate and recirculated through the ultrasonic reactor chamber, without sonication, for five minutes. After this step, ultrasonic output was initiated, exposing the flowing suspension to high-intensity acoustic cavitation. Samples were drawn from the main storage tank at selected time intervals for particle size analysis by laser diffraction (Aim-Sizer AS-2012). Both the reactor chamber and the transducer were cooled by water (10 °C), flowing through corresponding temperature control jackets. As seen in Fig. 1 and 2, the median particle size of CaCO3 was ultrasonically reduced from d50 = 20.32 µm to d50 = 1.33 µm. Although only one third of the amount of surfactant required by current ball milling processes was used , comparable results were obtained, and no particle re-agglomeration was observed after sonication. Figure 1. Calcium carbonate particle size distribution profiles at progressive sonication time intervals. The median particle size (d50) versus sonication time plot (Fig. 2) reveals that the required particle comminution (d50 < 3 µm) was achieved in less than 10 minutes. Figure 2. 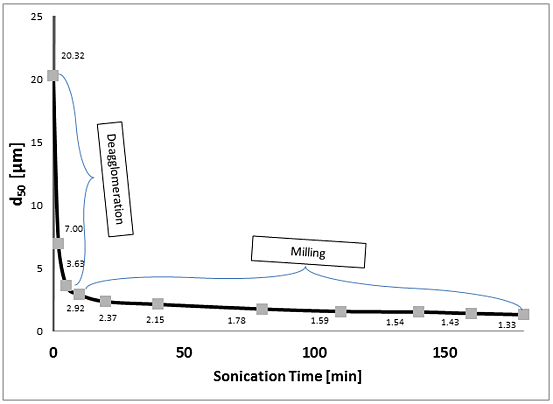 Calcium carbonate median particle size (d50) as a function of ultrasonic wet milling time. The steep and level sloped portions of the curve represent the deagglomeration and primary particle fracturing phases, respectively. The shape of the curve suggests two sequential size reduction mechanisms taking place: deagglomeration (predominant between d50 values of approximately 20 and 3 µm) and primary particle fracturing (below 3 µm). During the initial deagglomeration (dispersing) phase, large clusters of CaCO3 particles encounter high shear forces produced by the ultrasonic cavitation field, break up and disperse throughout the aqueous phase. After the agglomerates have broken into their primary particles, the individual particle fracturing phase becomes predominant. Fracturing, being a more energy intensive task, is characterized by a much lower rate of reduction as compared to the initial deagglomeration phase. Based on the above, it is reasonable to conclude that the original CaCO3 sample comprised agglomerates of primary particles with the median size of approximately 3 µm. Staying within the initial deagglomeration phase of the process is, therefore, sufficient for reducing the median CaCO3 particle size to the value required for its application as a cement additive. Using the BSP-1200 ultrasonic processor, this phase was completed in about 10 minutes, which corresponds to the processing rate of 150 mL/min (9 L/hr). 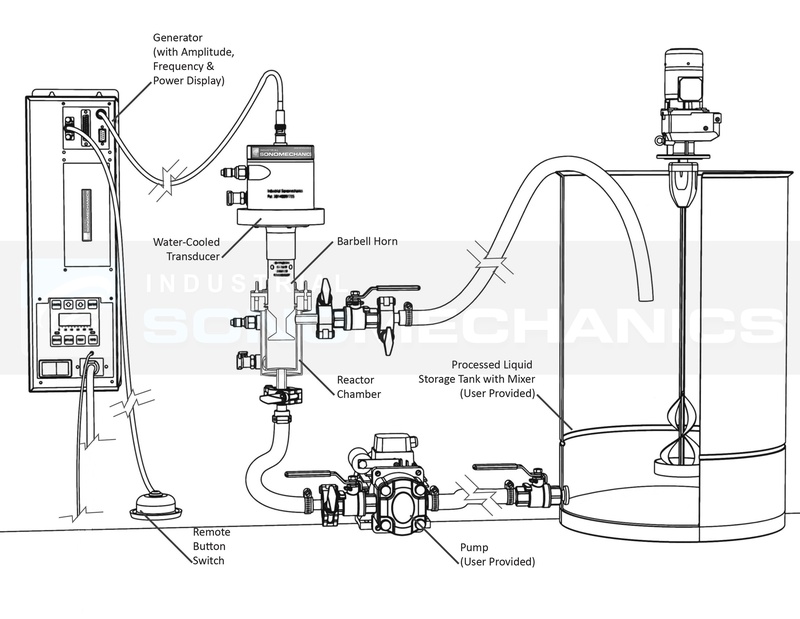 Transferring this process to the ISP-3000 ultrasonic processor would increase the rate to about 45 L/hr, since the scale-up factor from the BSP-1200 to the ISP-3000 processor is approximately 5X . Further scale-up can be achieved by using multiple ISP-3000 processors as shown in Fig. 3. Figure 3. Schematic of cluster of nine ISP-3000 industrial-scale ultrasonic processors. The bench-scale experiment described in this blog post demonstrates that high-amplitude ultrasonic wet milling is an attractive alternative to conventional wet media milling. Future work will be devoted to optimizing this process in terms of calcite and dispersant concentrations, dispersant type, ultrasonic amplitude, pressure and temperature. Optimization efforts will be followed by scale-up using the industrial ultrasonic processor, ISP-3000. Ramachandran, V.s. "Thermal Analyses of Cement Components Hydrated in the Presence of Calcium Carbonate. "Thermochimica Acta 127 (1988): 385-94. Web. 8 Sept. 2016. Matschei, T., B. Lothenbach, and F.p. Glasser. "The Role of Calcium Carbonate in Cement Hydration. "Cement and Concrete Research4 (2007): 551-58. Web. Sawara, Haruya, Tadashi Yamauschi, Hidetoshi Morishita, Seiji Katayama, and Yumiko Takase. 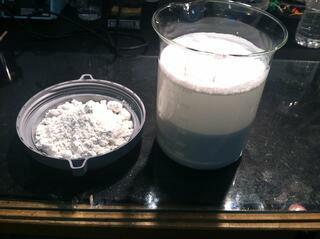 Concrete Containing Aqueous Slurry of Ground Calcium Carbonate. Fimatec, Ltd., assignee. Patent 6402831 B1. 11 June 2002. Print. Fuerstenau, D.w, and A.-Z.m Abouzeid. "The Energy Efficiency of Ball Milling in Comminution. "International Journal of Mineral Processing1-4 (2002): 161-85. Web. Barnett, M. I., and K. James C. "The Particle Size Distribution Of Marble On Wet Ball Milling. "Journal of Pharmacy and PharmacologyS1 (1962): n. pag. Web. Peshkovsky, Alexey.Making Stable Emulsions. N.p. : n.p., n.d. PDF. Mr. Shlomo Leibtag is a Research & Development Scientist for ISM. 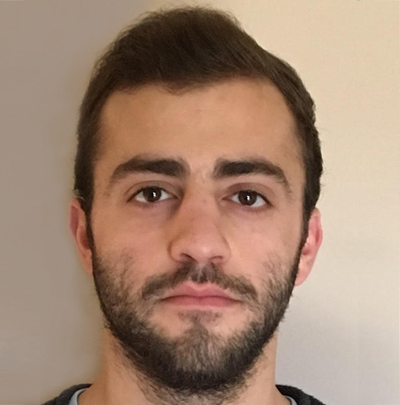 He is responsible for assisting with process and documentation development in multiple industrial application areas of ISM’s ultrasonic technology. Mr. Leibtag graduated from The Cooper Union with a B.S. in Chemical Engineering, majoring in Physical Chemistry. Previously, Mr. Leibtag held research positions at the Naval Research Lab, where he studied material properties of graphene via density functional theory, and Revolutionary Cooling Systems, where he examined alternative beverage cooling methodologies.